Democratic presidential candidate Barack Obama, seeking votes in Iowa, on Tuesday offered a plan to aid smaller farms, expand the renewable fuels industry and establish incentives for organic production. The Illinois senator called for a goal of producing 2 billion gallons of cellulosic ethanol by 2013 while ensuring that such an expansion doesn't increase pollution. Iowa leads the nation in ethanol production. "We must be vigilant to ensure that we do this in a sustainable fashion so that land and water resources are conserved," Obama said. Obama, Hillary Rodham Clinton and John Edwards are in a close fight in Iowa. Edwards also focused on rural issues as he campaigned in Dunlap, Iowa, arguing that his rural upbringing in South Carolina makes him unique among the candidates. "None of the other candidates come from small towns in rural America, and I do, and because of that, I spend a lot of time and energy on what we need to do to strengthen rural America," Edwards told a crowd of about 150 in a cattle auction cafeteria. Edwards called for enforcing antitrust laws to thwart corporate farming operations from monopolizing the business, capping farm subsidy payments at $250,000 and establishing a national fund to increase investments in rural communities. He also favors improving Internet access and offering bonuses of up to $15,000 to bring in top teachers to needy rural areas. Campaigning with Edwards was former Georgia Rep. Ben Jones, who played Cooter in the popular 1980s show, "The Dukes of Hazzard." Jones criticized former President Clinton in touting Edwards' candidacy. "Let me put it this way, I think the world of Barack Obama and he is the future of this party. Hillary Clinton and Slick Willie and those people, they are the past," Jones said. "John Edwards is the present for the Democratic Party." Clinton spokesman Mark Daley said in a statement that "insults and attacks from the Edwards campaign aren't going to solve our nation's problems." Obama told voters that if elected president, he would hold a rural policy summit in Iowa and submit a package of proposals to Congress within the first 100 days in office. A $250,000 limit on subsidy payments to farmers as well as strict environmental rules and enforcement for large livestock operations. Creation of new cost-sharing programs to help farmers get certification as organic farmers, and revamping crop insurance programs to avoid penalizing organic producers. A goal of a 50 percent increase in the economy's energy efficiency by 2030. A change to allow small businesses to pool together to offer health insurance for workers, with subsidies for those who can't afford it. Also, overhaul the Medicare and Medicaid reimbursement system that can penalize rural areas. 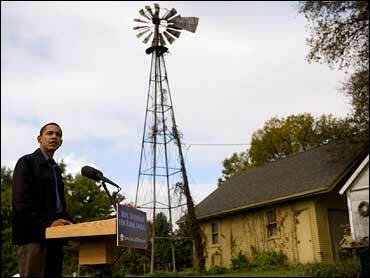 Though Obama's message for the day was rural policy, rival Clinton was clearly on his mind. While touring businesses in downtown Vinton, Iowa, shop owner Kay Dowd reminded Obama that Clinton had offered a universal health care plan. Obama quickly countered that he offered a similar plan first and said the question was who could push a proposal through Congress. "It can't be the same kind of partisan battling we had in the '90s," said Obama, saying Republicans must be persuaded to go along. "I think I can do that better than Hillary Clinton and that's why I'm running." Earlier in the day, Obama dismissed criticism that he'd unfairly attacked Clinton. Obama said he's merely drawing distinctions. "I don't think there's anything we've said that would be considered a gratuitous potshot," he said.